Guru Amar Das 5 May 1479 – 1 September 1574) was the third of the Ten Gurus of Sikhism and became Sikh Guru on 26 March 1552 at age 73. Amar Das adhered to the Vaishnavism tradition of Hinduism for much of his life. One day he heard his nephew's wife, Bibi Amro, reciting a hymn by Guru Nanak, and was deeply moved by it. He persuaded her to introduce him to her father, Guru Angad, and in 1539, the year Guru Nanak died, Amar Das at the age of sixty met and devoted himself to Guru Angad and became a Sikh. In 1552, after the death of Guru Angad, he became Guru Amar Das, the third Guru of Sikhism. Guru Amar Das was an important innovator in Sikhism, who introduced a religious organization called the Manji system by appointing trained clergy, a system that expanded and survives into the contemporary era. He wrote and compiled hymns into a Pothi (book) that ultimately helped create the Adi Granth. 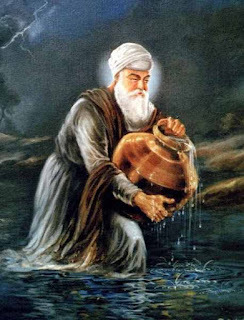 Guru Amar Das helped establish the Sikh rituals relating to baby naming, wedding (Anand Karaj), and funeral, as well as the practice of congregation and celebrations of festivals such as Diwali, Maghi and Vaisakhi. He founded centres of Sikh pilgrimage, and picked the site for the Golden Temple.